When the freeway is congested and traffic a little sluggish, it’s an advantage to ride a motorcycle and have nerves of steel. Or at least enough skill to run on the lane markers and pass between vehicles right and left without hitting anything. 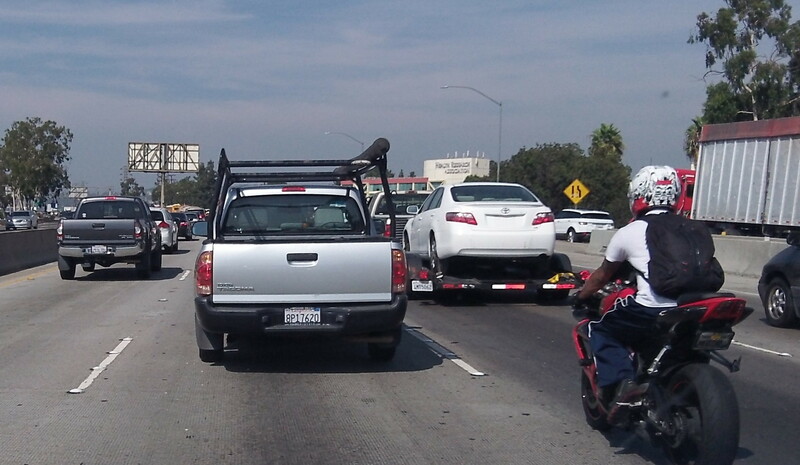 I don’t suppose it’s legal, what this guy and the one below were doing a few days ago on the 5 heading north into LA. But it worked. If your driver’s ed in high school included routine runs on a Southern California freeway — the San Bernardino, in my case, with Mr. Bush instructing us to speed up a little when changing lanes because you have more distance to cover on the diagonal — it’s always fun to get back to some real traffic. At least for a while. Speaking of which, it’s worth noting that the Oregon Transportation Commission continues to refuse to take advantage of the state law that allows it to raise freeway speed limits to 70 miles an hour. In contrast to Oregon, 70 mph is the limit on most segments of I-5 up and down the length of California, which means that the drive, while long, does not take quite as long as it otherwise would. Lane splitting is legal in California. I wouldn’t consider it safe much over 35mph though.